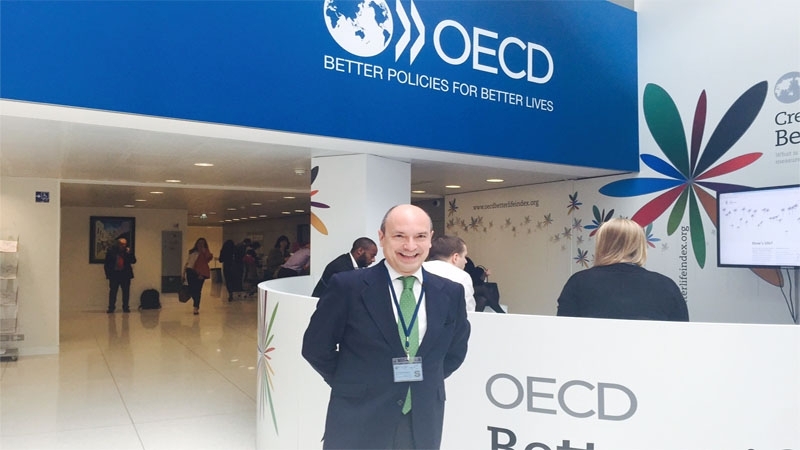 IE recently served as knowledge partner of the Annual OECD Forum (Organization for Economic Cooperation and Development) focused on “Investing in the Future: People, Planet, Prosperity.” The event was held in Paris on June 2 – 3. Santiago Íñiguez de Onzoño, President of IE University and Dean of IE Business School, examined the key factors of leadership of the future in the 2015 OECD Forum’s Idea Factory Forum dicussion on “Shaping Our Future Leaders.” The main themes discussed included the impact of the lack of leadership on the economic crisis and the role influential institutions like business schools play in shaping future leaders. Other speakers in the interactive session included Colm Harmom, Director of the Faculty of Social Sciences of the University of Australia; William Saito, Adviser to Japan’s Cabinet Office; Maria Tereza Fleury, Dean of Escola de Administração de Empresas de São Paulo of Fundação Getulio Vargas; Fred Kiel, author of “Return on Character: The real reason leaders and their Companies win”; Silvana Koch- Mehrin, CEO and founder of Women in Parliaments Global Forum (WIP); and Kevyn Yong, Adjunct Professor of Management at ESSEC Business School. Santiago Íñiguez de Onzoño shared with participants his commitment to a humanistic approach to leadership and to educating top-tier members of the business community. He spoke of how leaders of the future have to know how to combine analytical intelligence with technology and emotional intelligence, and how it is essential to continue to foster innovation in education, technology, materials and to use new formats. IE, together with the University of Geneva and Sydney University, served as an international academic institution of the Forum. The event was opened on June 2 by Helen Clark, Administrator of the United Nations Development Programme (UNDP), and the Secretary General of the OECD, Angel Gurría. The speakers and participants of the 2015 OECD Forum discussed key issues for achieving a sustainable future, including the promotion of inclusive growth, tackling inequalities, rebuilding confidence in the system, and fostering sustainability. The forum also included the presentation of the latest edition of the “Better Life Index”, prepared by the OECD to gauge people’s quality of life and to be able to compare those of different countries. The program for Wednesday, June 3, included the presentation of the OECD’s report on the economic outlook, drawn up on an annual basis. On the same day the ministerial meeting was held, presided this year by Holland, with Vice Presidents from France, the Czech Republic, and Korea, to share visions of a future with greater sustainable, equitable, and green growth. IMBA students participated in IPEC competitionOur IE Dubai Center is now open!